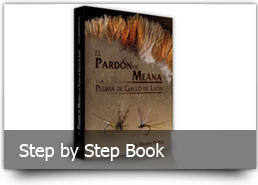 Famous journalist collaborates in fly fishing magazines of several countries, writer, publisher, and creator of the recognized tying pattern "Pardón de Meana. He's, fundamentally, a passionate fly fisherman since over 30 years. Work as professional guide since 2005 and he's considered as reference for the sea trout, big trout and barbel fly fishing with dry fly. Luis Meana is pioneer and specialist using very long leaders for dry fly fishing and assure that it use is most easy and effective. Fishing guided.- Luis will organize your fishing day specially for you and your buddies (Sea trout, big trout, barbels, etc…) Taking a professional guide, helps you to enjoy of the best sections in the best moment and expanding to outstanding your possibilities to succeed. Special Packs.- We can organize a pack for several fishing days. We take care of everything: accommodation, translations, dinners, etc. 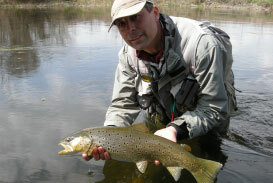 Technical journeys.- Fly casting courses, fly tying or fishing strategies given by Luis Meana. It can be integrated and combined during the fishing days. Click here and you can look up more details and prices. 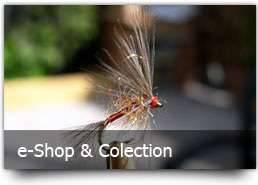 www.flyfishingbarbel.com.